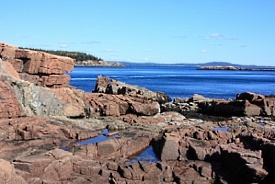 Bar Harbor sits on Mount Desert Island, just off the rugged coast of Maine. It is surrounded by Acadia National Park, where beaches, forests and granite cliffs make up some of the country's most beautiful scenery. Visitors can cruise Frenchman's Bay, join a whale-watching adventure or enjoy a New England lobster bake. In town, there are shops, museums and art galleries to explore.